Following the teachings of Jesus Christ, the Roman Catholic Church, and the Hospitaller Order of St. John of God, Camillus Health Concern provides Christian hospitality and respect for life through direct service. The mission is to treat the mind, body and spirit of the poor and homeless in South Florida, via the delivery of health and dental care, substance abuse treatment, and social services. Camillus Health Concern is a religious apostolate of the Hospitaller Order of St. John of God and the Roman Catholic Church. The spirit and content of the Code of Canon Law pervades throughout the governance and corporate life of Camillus Health Concern. We join in faith to facilitate the unfolding of God’s providential plan in every aspect of our organization. Our readiness to meet the complexity and concerns of our brothers and sisters in need identiﬁes us as a mission of hope. Camillus Health provides a comprehensive and multidisciplinary range of primary, preventive and supplemental health services for all patients. Services include primary adult and pediatric medical care, women's health services, podiatry, oral health, dermatology, behavioral health, transportation, and case management services. We offer primary health care services through its main site in downtown Miami and operates satellite sites at the Salvation Army, Better Way of Miami and Camillus House homeless service organizations. Camillus Health Concern held a tremendously successful Health Fair August 18th. Beyond the hundreds of individuals attending and the more than two dozen community partners, a dozen new patients were registered and scheduled. 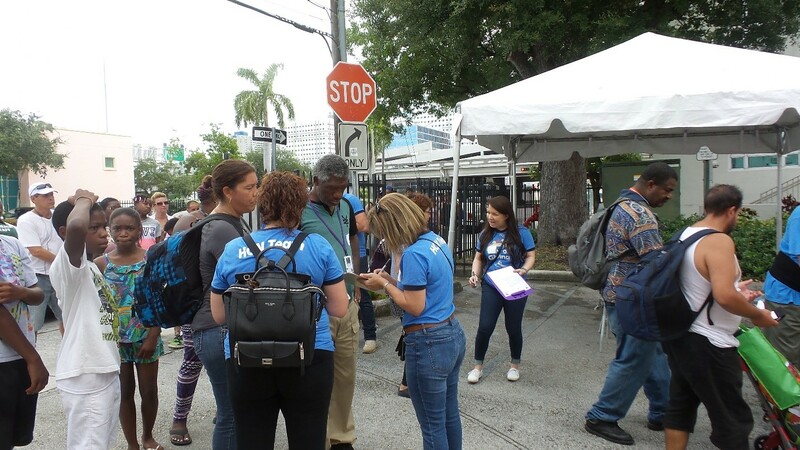 Providing a seamless process for people experiencing homelessness to learn, get screened, get scheduled and get clinical care was a terrific opportunity to reach the community. One person even needed to go to the Emergency Room because of signs related to a stroke! Three dozen people had healthy blood sugars and blood pressure readings, but others had few challenges with the blood sugar and blood pressure. Services encompass a broad spectrum of health care, including preventive care, episodic care for acute illness, chronic disease management, and specialty and surgical referrals as needed. A full dispensary service provides medications at no cost for those who have no other resource. Our Behavioral Health Department helps our patients with biological, psychological and sociocultural factors in human development and functioning. We provide Mental Health therapy and counseling (both individual and group) and Substance Abuse treatment utilizing tools such as DUST, AUDIT, and PHQ9. Dental provides primary dental including dental exams, x-rays, restorations, dental extractions and cleanings. We welcome all patients without insurance in order to help them maintain/improve their dental care. Our Clinic offers Public Benefit Assistance and Referrals for housing for our homeless patients. In addition, our SOAR Case Manager assists all individuals processing of claims to Social Security Supplemental Income and Disability Insurance.